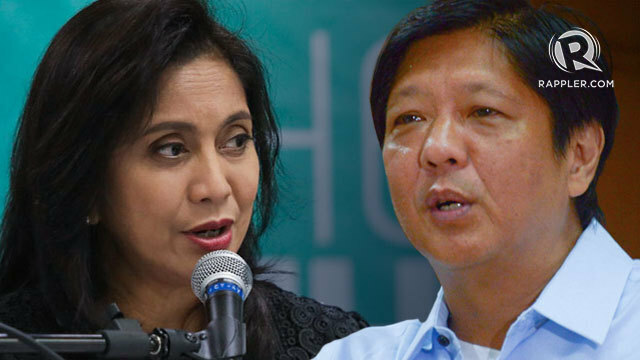 MANILA, Philippines – Like relatives of his self-proclaimed wife Kris, he has made it a habit to enter politics. But unlike politicians from the Aquino family, he has always been declared a nuisance bet. 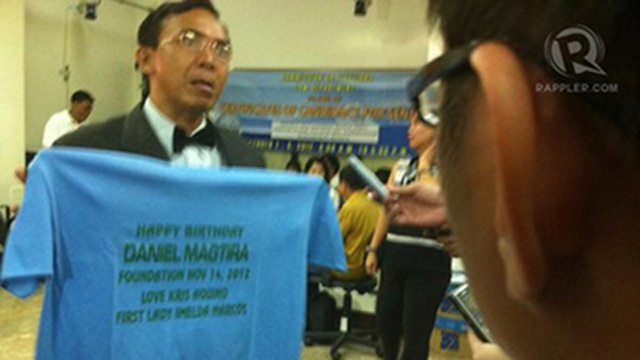 Daniel Magtira, 52, listed Kris Aquino as his spouse when he filed his certificate of candidacy (COC) last October 1. It was not his first time to do this, having run for various positions for the past 11 years. A Commission on Elections (Comelec) resolution in 2009 shows that Magtira already ran for president in 2010 and 2004, and for senator in 2007 and 2001. The Comelec repeatedly disqualified him as a nuisance bet. Like Magtira, a fifth of those who filed their senatorial COCs last week have previously been disqualified by the Comelec. Declared as nuisance candidates, they range from those who are mentally unfit, to those who want to confuse the public, to those without financial means to run a nationwide campaign. During this year's COC filing, however, the Comelec still granted them their 15 minutes of fame. Why does the poll body keep on entertaining habitual nuisance bets? Comelec Chair Sixto Brillantes Jr said it's all about fairness. “Filing a certificate of candidacy is a matter of right. They have the right to file. We cannot prevent them,” Brillantes said in an interview. He said even habitual nuisance bets deserve due process, as required by the law. Brillantes said in the next few days, the Comelec will send notices to all candidates who appear “illegitimate,” and will subject them to a hearing within 10 days. Within 5 days from the last day of filing COCs, any registered candidate for the same position could also petition the Comelec to declare someone as a nuisance candidate, according to Comelec Resolution No. 9523. This was what happened when now Sen Alan Peter Cayetano, in the 2007 senatorial race, sought the disqualification of a certain Joselito Pepito Cayetano. He believed the Arroyo camp used the other Cayetano to sabotage his senatorial bid. 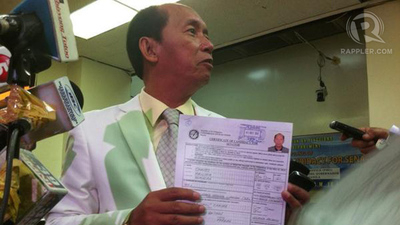 The Comelec later declared Joselito Pepito Cayetano a nuisance candidate. Then a senator, now President Benigno Aquino III in 2007 also sought the disqualification of a certain Theodore Aquino. The Comelec also declared the latter a nuisance candidate. For 2013, Brillantes said the screening of nuisance bets could drastically lower the number of senatorial candidates for 2013. The last time the Philippines held midterm elections – in 2007 – the Comelec disqualified half the number of senatorial candidates, decreasing them to 37 from 79. Nuisance bets abound partly because of the Constitution's loose requirements for occupying the Senate. 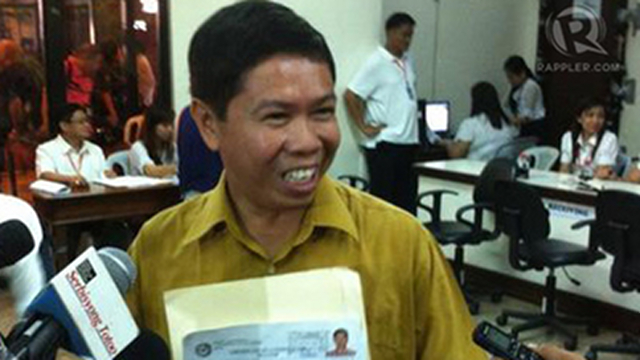 “No person shall be a senator unless he is a natural-born citizen of the Philippines and, on the day of the election, is at least 35 years of age, able to read and write, a registered voter, and a resident of the Philippines for not less than two years immediately preceding the day of the election,” says Article VI, Section 3 of the 1987 Constitution. 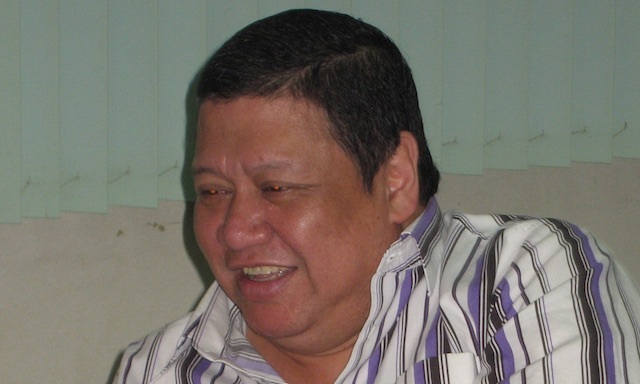 Why, then, does the Comelec have to disqualify nuisance bets? In a 2004 resolution, the Supreme Court (SC) clarified that running for public office is a privilege, not a right. The SC's Resolution No. 161872, dated April 13, 2004, addressed the complaint of lawyer Elly Pamatong, then declared a nuisance bet in the 2004 elections. Pamatong wanted the Comelec to reverse its decision because it allegedly violates his right to “equal access to opportunities for public service,” as enshrined in the Constitution. “Implicit in the petitioner’s invocation of the constitutional provision ensuring 'equal access to opportunities for public office' is the claim that there is a constitutional right to run for or hold public office and, particularly in his case, to seek the presidency. There is none,” the SC said. To ensure that the equal access clause is not violated, the key is to apply the limitations “to everybody equally without discrimination,” said the SC. “Equality is not sacrificed as long as the burdens engendered by the limitations are meant to be borne by anyone who is minded to file a certificate of candidacy,” the High Court said. “The State has a compelling interest to ensure that its electoral exercises are rational, objective, and orderly,” the SC said. “To add into the mix candidates with no serious intentions or capabilities to run a viable campaign would actually impair the electoral process. This is not to mention the candidacies which are palpably ridiculous so as to constitute a one-note joke. The poll body would be bogged by irrelevant minutiae covering every step of the electoral process, most probably posed at the instance of these nuisance candidates,” the court explained.